My mobile rang yesterday and when I looked at the caller display, my heart sank. Don’t get me wrong; he’s a lovely guy. He’s always pleasant and he’s certainly efficient in what he does. But, because he’s an insurance broker, I know when his name appears on my phone it’s going to cost me money. It’s not Çagri’s fault that all the policies we have are due for renewal in January; it just seems to have happened that way. It’s also not his fault that lots of other bills always need paying at the same time as well. But, just the same, when Çagri calls – although I always try to be as bright and cheerful as he is – inside, I can’t help getting that sinking feeling and an urge to hide my wallet. When you first arrive in a new country, it doesn’t really occur that you’ll be opening bank accounts, setting up direct debits and buying new insurance policies all at roughly the same time. It’s just stuff that needs to be done. So neither of us really gave any thought to the idea that, once we’d made a start, annual bills would fall at around the same time every year and – bracketed by the kids’ birthdays as well as Christmas – our bank account was always going to take a hammering in January. Turkey’s economic situation hasn’t helped this year either. With inflation running at over 20% and the pound now worth almost 7tl rather than the 3.43tl it was when we arrived, insurance premiums have gone through the roof. The result? We’ll probably be having fewer of life’s little luxuries and shopping at the markets where, thank God, fruit and veg and many of the basic requirements of life are still delightfully cheap. But, if you’re planning on making 2019 the year you make a fresh start somewhere sunny (and possibly as far away from Brexit as possible) take my advice and try not to buy everything at once. Take your time, plan a little and stagger any significant purchases. If not, to borrow a phrase from Blackadder, there will come a time of year when you find yourself feeling a little like a pelican; no matter which way you look, you’re still facing an enormous bill. Fruit and veg from the markets … Still cheap enough to help keep us cheerful in a punishing month for the bank account. This entry was posted in Life challenges, Moving abroad and tagged life as an expat, life lessons on January 16, 2019 by theparsleys. Something you don’t find many of in Turkey and, when you remember the country was invaded as recently as 100 years ago, I suppose it’s easy to understand why. When your homeland borders seven other nations – and when some of them are notoriously unstable – it probably makes sense not to make it too easy for any foreign force to find its way from A to B. However, when you’re getting to know your patch and having to make do without names for many streets, roads or even landmarks, it does mean you pretty much have a free hand to make them up yourself. “I just told you … The Waterfall,” he said, looking a little perplexed. It seemed a little laconic for such a beautiful place which I felt deserved something more poetic so, subsequently, when I posted the images on Facebook, I called it “The Secret Waterfall”. I have no idea if it was as a direct result or if it was just a coincidence but, soon, the tourism groups on Facebook seemed to be awash with requests for more information about the location of “The Secret Waterfall”. Boat captains were being urged to head for it and it seemed – even if I wasn’t the first to use it – the name had certainly stuck. But not all locations we’ve come up with names for are quite so … romantic. Others now in common use around our house – largely used to describe locations on our regular dog walk routes – include Dead Sheep Gorge (because there was one); Wild Boar View (because there was one – in fact, a family of five); Biscuit Rock (as it’s where the dogs used to stop for a break and a treat) Hot Hill (because, in summer, it really is when you have to climb it) Runaround Dog (as the dog at this house invariably runs around barking when you pass by) Flagpole Farm (yep, you guessed it) and finally Pooh Corner (I’ll leave that one to your imagination). I suppose, as a result, it’s now much easier to understand how far-flung places in America’s Wild West or the Australian Outback got their outrageous names. Admittedly, Runaround Dog doesn’t really match Boing Boing or Lick Skillet for imagination but we really only invented our location names so we could tell each other where we were when we saw an eagle, found a porcupine quill or encountered something unpleasant someone else had left behind. But, to our slight embarrassment, we’ve noticed some of our friends have started to use them too. Albeit unwittingly, it seems we may be responsible for parts of the picturesque and historic Kaya Valley becoming known by some less-than-salubrious identities, at least among some of the English residents. So if you ever become a nation’s leader remember this: although a lack of maps and street names may make life a little harder for an invader, it does leave your homeland exposed to a different risk. You may remain a free nation and be able to determine your own destiny – but you may also end up with a Rubbish Road (because it’s where people seem to tip stuff they don’t want), an Outraged Olive (a tree which reminded one of us of Harry Potter’s Whomping Willow) or a Pooh Corner which has nothing whatsoever to do with cute bears. This entry was posted in Life challenges, Moving abroad and tagged cartography, Kabak, maps of Fethiye, maps of Kayakoy, maps of Turkey, naming places, place names, Turquoise Coast on December 18, 2016 by theparsleys. Dogs were never part of the master plan. For a start, when we arrived in Turkey just over a year ago, two cats travelled with us and they had made their utter disdain for all things canine abundantly clear. However, that was before our landlord unexpectedly ambushed our daughter with a puppy while Bec and I were out shopping one day, (https://theparsleysabroad.wordpress.com/2014/07/23/puppy-love) and before another bundle of blonde fur decided to camp on our doorstep until we lost the will to stop her moving in last Christmas Eve. Then in April I met the owner of the summer season accommodation and restaurant on the northern boundary of our garden while I was walking them one day. 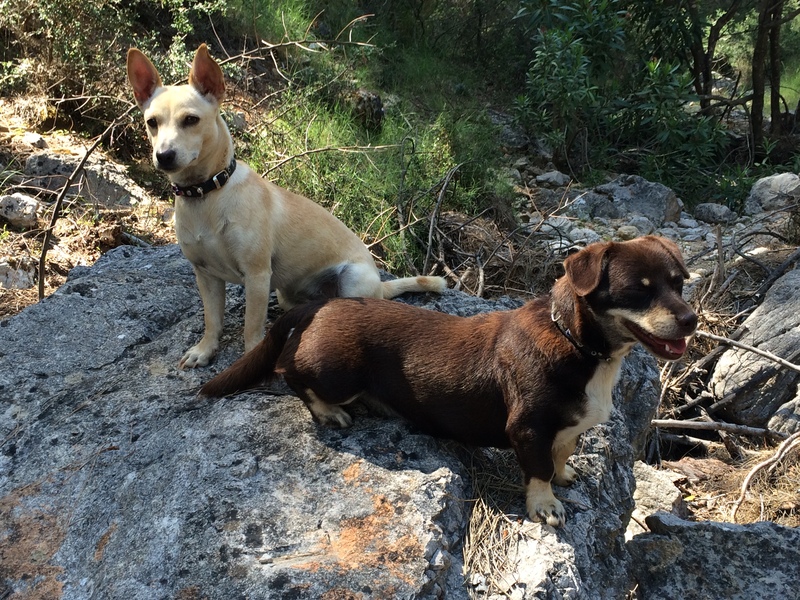 “Are these your dogs?” he asked with the kind of smile which usually precedes some complimentary comment about how cute they are. “Yes, we love your dogs – but you will have to stop them barking,” he said, suddenly fixing me with a deadpan stare. To be frank, the sudden accusation that I was the owner of two hounds from hell came so much out of the blue I wasn’t sure what to say next. “Um … They are dogs and they are going to bark sometimes, like all the other dogs in the village,” I heard myself saying. I’ll admit that at that point there had been two or three nights over the past six months when I’d had to get out of bed in the early hours to tap noses and wag a stern finger in front of furry faces after half an hour of yapping at shadows, but suggesting our two were solely responsible for the nightly cacophony across the whole village seemed a bit rich, especially coming from someone only resident in the area for the summer months. Nevertheless, sensing I wasn’t going to win this particular argument, I said something non-committal, made my excuses and decided to consult our neighbour – and one of the village bigwigs – Tommy later. I didn’t need to wait though. Within an hour of me returning home and discussing our dilemma with Bec, the phone rang. “Hi Tommy. I was going to call you actually…. “And how do you suggest I do that? It takes time to train dogs to stop barking. You can’t just switch them off… I’ll do what I can now I know it’s a problem but ours are no worse than half a dozen other dogs up the lane. They all bark as well. And what about the cockerels, the peacocks, the sheep, the cows? This is a village. There’s always a noise somewhere. He was proved right – at least to an extent. The same complainant has since left a terse note on our gate after we had tea with friends reasoning, as it wasn’t late, the dogs would be fine on our balcony for an hour or so. We have also had a visit from the village head man – sent by the same neighbour – who instructed us to stop our dogs barking “all the time”, even though we’ve since had considerable success with reward-based training which has limited outbreaks of barking to no more than a handful, usually provoked by lost tourists riding up to our gates on noisy quad bikes. On another occasion, I found the dogs being deliberately provoked into a frenzy before I could reach them by an old man from another neighbouring property poking a stick though the gate and waggling it about in front of them. With this in the background and our status as “guests” in Turkey apparently at stake, we have been forced to resort to English habits and have kept the dogs inside at night almost since the summer season began. I was therefore horrified the other night when, after Bec and I had gone to bed, our daughter returned home from a meal out with the two teenage holidaymakers she has befriended and accidentally released the dogs into the garden at midnight. Such had been our recent success with training them, any late-night barking has been reduced to a flurry of yaps before the dogs have remembered themselves and resorted to merely wagging tails and excited sniffing of hands and shoes. However, this time, something clearly alarmed them as I heard them run full pelt into the darkness of the orchard, barking hysterically as though our lives were in dire peril. Without thinking, I was out of bed, down the stairs and in the garden. At that point, my only concern was warnings of poison, the visit from the head man, and possible “trouble” from villagers who, for all I knew, could soon be at our gates with pitchforks and burning torches demanding our immediate expulsion from Kayaköy. It was only when I hurtled onto the porch and down the short flight of steps into the garden that I wished I’d also considered some additional clothing. Dressed in nothing more than what I can only describe as saggy, unflattering but comfortable pyjama shorts, I was confronted by two teenage girls and their parents, hopping from one foot to another as two excited dogs barked around their ankles. Presented with four complete strangers turning up at their house in the middle of the night, the dogs were giving it the works, backing off to circle them and then darting in with upturned faces to bark shrilly and excitedly at any sudden movement. With my distinct lack of decency in mind, I tried to persuade the family to walk briskly towards the house, bringing the dogs into range where I hoped our daughter would be able to intervene and bring them in – but to no avail. It quickly became evident the only way to quell the noise quickly would be to stride masterfully up the drive and assert some authority. It worked on the dogs. One recognised the tone of my voice and was back inside like a shot. The other retreated into the vegetable garden and rolled over on her back, showing her tummy as an apology and awaiting collection. It only took a few seconds to make the detour from the drive, pick her up in my arms with some stern admonishments and then carry her back to the house. However, those few seconds were probably more than enough for the bemused family. I left Bec to call an apology and a farewell from the house as I strode back in, contrite dog under one arm, and unflattering bottom cleavage peeping out of the top of my shorts. This entry was posted in General, Keeping pets, Life challenges, Moving abroad, Pets and tagged barking dogs, dogs barking, Kayaköy, living in Turkey, noisy neighbours, owning a dog, Turkey on August 3, 2015 by theparsleys. A red-and-white sign at the top of our lane reads “Çıkmaz Sokak” and, as we knew “sokak” translates from Turkish as “street”, it was a natural assumption that adding our house number would give us the first line of our new address. The rest was a little less obvious. With no postal deliveries made to individual homes in Kayaköy, we sort of got the impression you could more or less make up your own and if we’d gone with “The Lane Behind Cin Bal Restaurant, Follow It Until You Fall Off The End”, nobody would’ve raised an eyebrow. It seemed the only important bits were the name of the village and the district number; as long as they were included, our post would find its way to the local shop for collection. “You have not filled in forms right,” he said. “This is not your address,” he added, pointing to the line faithfully filled in 47 Çıkmaz Sokak. 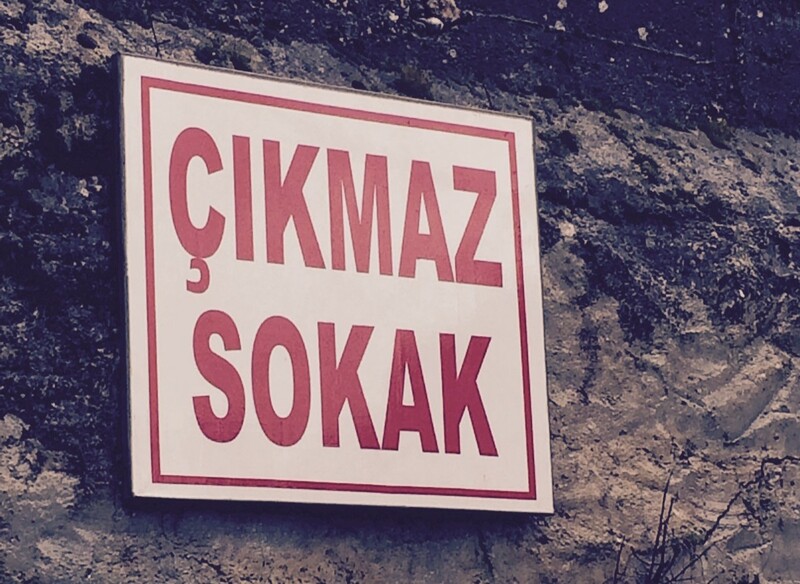 “Oh but it is … There’s even a new sign saying ‘Çıkmaz Sokak’ at the end of the road,” I said. We won’t bother with the details of what happened next. Let’s just say, after two days of form-filling, traipsing from one official building to another and smiling hopefully at stern-faced officials, the whole tortuous residency procedure was complete and the seals were put on our (ultimately successful) applications to live in Turkey. (If you’d like a bit more on that particular episode you could always read an earlier blog, The Day We Ran Headlong Into The Language Barrier). However, the issue over the wrong address still baffled us – at least until our latest Turkish lesson at the weekend. We’re on to verbs and teacher Bülent was explaining the verb “çıkmak”, which means “to exit” or “to leave”. “Ah… So that means our road is the one which leaves the village,” I said somewhat triumphantly. Yep. That’s right. For six months, I’ve been happily telling people we live at “No 47 No Entry”. Suddenly, all those odd or slightly pitying looks made a bit more sense. Tommy and the head man weren’t being obstructive either. By not really explaining why I had to change my application form, they were just trying to protect me from some future embarrassment. I would like to end by recording my thanks to both – and by continuing to resist a powerful urge to crawl under something and hide. 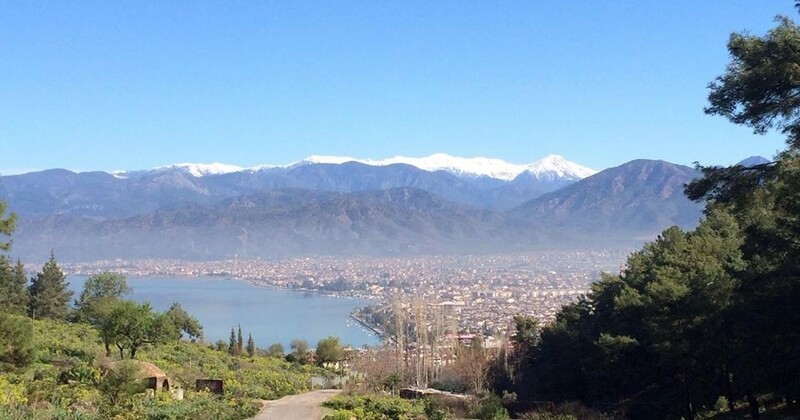 This entry was posted in General, Life challenges, Moving abroad and tagged British abroad, Fethiye, Kayaköy, life in Turkey, living in Turkey, No entry, no through road, Turkey, Turkish language, Turkish road signs on January 29, 2015 by theparsleys. Anyone for a Turkey dinner …? “I’m afraid I’m going to have to ask you to relinquish your chair, dear boy,” said the gentleman in the fedora sitting opposite in a rich English accent which could have been cultivated in the halls of Eton. “Gunfighter?” I asked with a smile. “No, dear boy. Just something I learned in Morocco,” he replied without a hint of mirth. As we duly swapped seats, I was thinking this was hardly a conventional introduction to the village’s ex-pat community – albeit an intriguing one. We’d seen groups of Brits gathered in bars and restaurants of course, and we’d even been told by Turkish friends that if we wanted to make their acquaintance, then they always seemed to meet in the same places and at the same time every week. From a distance, others we’d seen in bars and restaurants up and down the harbour in Fethiye during the summer looked to be close-knit groups; mostly retired, mostly deeply tanned by years in the Mediterranean sun and, I’m afraid to say, emanating that slightly superior attitude that as a race the British tend to use, particularly towards people in the service industry. So when it became evident that most of Kayaköy’s ex-pat community would be attending the same (and only) restaurant in the village laying on a traditional turkey dinner on Christmas Day, I’ll admit to being a little apprehensive. But despite the slightly unorthodox introduction, I needn’t have worried. Aside from his slightly Coward-esque demeanour, I found my closest fellow dinner guest entertaining, charming and a fascinating raconteur. Another retired couple sharing the same corner of the tiny “lokanta” also proved to be kind, patient with our lack of experience “in-country” and generous to a fault. Indeed, in such an intimate setting, it was easy to forget the temperature was mid-20C outside, that tinsel and Christmas trees had been scant to say the least and that not a single TV ad so far had tried to persuade me to buy a three-piece suite. We pulled crackers, read out dreadful jokes, ate far too much and, after a thoroughly enjoyable few hours, waddled out the door after bidding our hosts (both Muslim and Christian) a merry Christmas. As we left, I glanced across to the tea house next door – a bastion redolent of Turkish tradition, card games, backgammon and cigarettes – which hardly seemed to register our paper party hats and slightly raucous farewells. Sensing that indifference, it would’ve been easy to suddenly feel a long way from home; for family and friends in the UK to seem a long way away – and I can’t deny we have missed them. But, instead, that sudden realisation of juxtaposition, the sudden contrast, underlined many of the things which inspired us to try life in a different country in the first place. Christmas is about family and friends, about reconnecting. But it’s also about giving thanks for what we have – and, at that moment, I was grateful all over again for that sense of adventure which brought us here six months ago. The rest of the Parsleys tucking into a traditional turkey dinner. Merry Christmas! 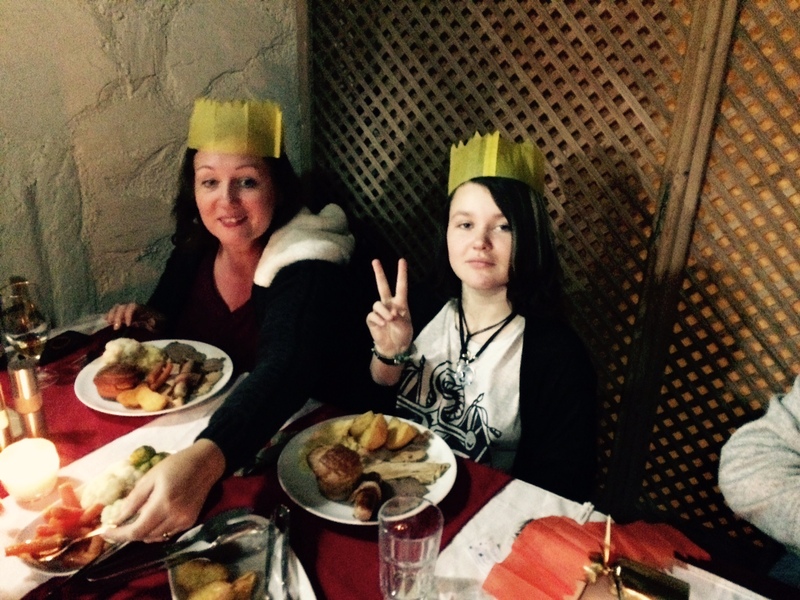 This entry was posted in Life challenges, Moving abroad and tagged British ex-pats, Christmas in Turkey, Fethiye, Kayaköy, Turkey dinner on December 29, 2014 by theparsleys.